Only two months left of 2017...how are you doing on your goals??? I wish I were doing better on mine, but I'm okay with where I am. 2017 was a rebuilding year for me, in a way. I worked on myself and worked on being the person I want to be. #1: Make Simon and Schuster regret dropping me. #2: Publish Lemonade in Hell, either traditionally or indie. I've made some progress here...sort of. I had lot of requests for it that I'm still waiting to hear back on. I had some great critiques and was able to work on it and make it a better book. So fingers crossed. But once I hear back from the handful of agents and editors who have it, and if it doesn't go well, I plan to start the process for publishing it myself. It's scary as hell, but I can't put this book on the shelf and aways wonder, "What if?" #3: Write book 2 in the beverage series. #4: Reach $100,000 in Disney sales for the year. Sadly, I will not reach this goal :( BUT I did increase sales this year by over 30%, so I'm happy with that. My business is growing and I'm starting to get more and more referrals, so I feel optimistic about reaching this goal in 2018. 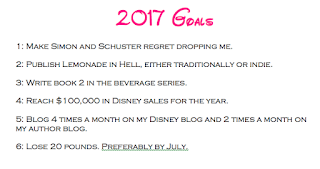 #5: Blog 4 times on month on my Disney blog and 2 times a month on my author blog. I've been really inconsistent this year with blogging and I did make attempts to be better at it. I ultimately did not post as much as I wanted. BUT I'm working on it and plan to get into a better habit these last two months of the year. #6: Lose 20 pounds. Preferably by July. I gave it my best effort, but due to underlying health conditions, it just was not possible for me to lose weight. But I think the underlying conditions are managed...somewhat...so going forward, I hope to be in a better place to start losing the weight. So that's me. 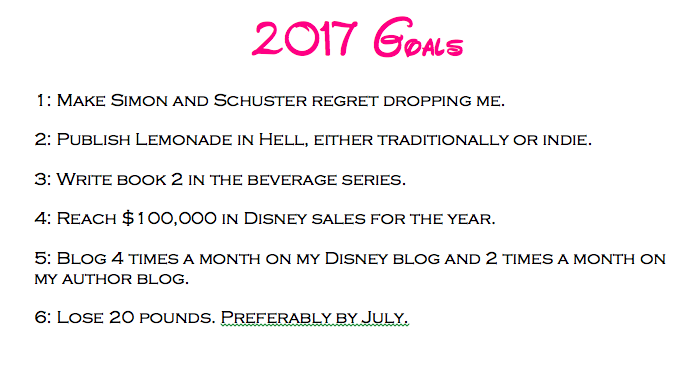 What goals did you make for 2017? Where are you in achieving them?? ?